Minnesota Treasure - Irvine Park. 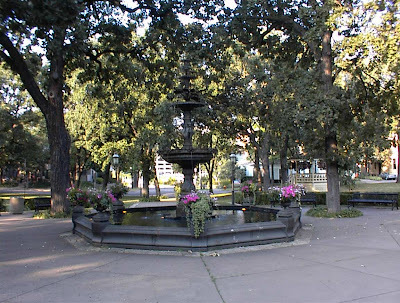 One of the most beautiful parks in the city is a small green place surrounded by old Victorian Houses and nestled quietly within walking distance of downtown Saint Paul and West Seventh Street (Old Fort Road) and located near the famous Forpaugh's restaurant. Some records have Irvine Parks original establishment on drawings as early as 1849, but it wasn't officially finished until an early spring day in March 1872 when the square was dedicated and named "Irvine Park" in honor of its donor John Irvine. A new fountain was installed by the Pendergast brothers in 1881 at a cost of $900. The Park was established as a New England style town square park and was surrounded by the stately Victorian mansions that bordered its edges. 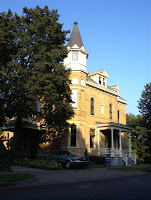 The large homes were symbols of Saint Paul's early wealth. The homes, park and surrounding area were the center of affluence in the city. As the wealthy began to move away to "better" new locations such as Grand and Summit Avenues, the area gradually deteriorated. By the 1970's the park had become a home for vagrants and rusty playground equipment. By this time, 96 percent of the areas properties were listed as sub-standard by the City. In 1927 the original Perdergast fountain was removed and its metal scrapped when the park was re-designated a "playground". The area had already been tagged for urban renewal when locals and planners began to recognize the area’s historic significance. The entire area was nominated to the National Register of Historic Places in October 1973 and in 1981 it was given Heritage Preservation statue. The Robinson Iron Company of Alexander City, Alabama, was contracted in 1978 to cast a new fountain. The new fountain is not an exact replica of the original but resembles it in height and design. The cost of the replacement fountain 100 years after the original was built, was approximately $40,000. Through the work of the local community, Mayor George Latimer and many others, the Park was re-deditcated on October 1, 1978. Taking a walk in the park now is like a stroll back in time, when simply being in a beautiful place could lift your spirit. Its mature trees, spectacular fountain and inviting Gazeebo in addition to its views of downtown and the river make this Park a Minnesota Teasure.